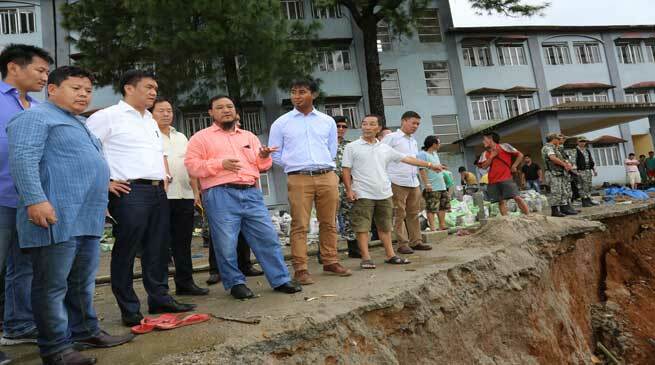 CM Pema Khandu make spot inspection of the landslide site near the Accountant General ( AG ) building at Mowb-II today wherein the RCC retaining wall collapsed due to massive landslide on July 25 last. Chief Minister instructed the Chief Engineer of CPWD, the executing agency to immediately reconstruct the RCC Retaining Wall giving a strong foundation and heavy reinforcement. He also asked the department to build an extra support to the retaining wall to protect the compound and the office building of the Accountant General. He also directed the SE PWD, Capital Division A to immediately clear the landslide debris deposited on the road and to keep the road thorough for the vehicular movement. Departmental people informed that Chief Engineer of CPWD is arriving to take stock of the situation and assured to take remedial measures as per his directives. Chief Minister was accompanied by Markio Tado, MLA and Kahfa Bengia, Ex-Minister, Er Rotu Techi, SE PWD and Officials of CPWD was present during his site inspection.